So I gotta tell ya guys, there’s Navy Bean Soup, plain old Senate Navy Bean Soup. And it’s good. But that was my Mother’s Navy Bean Soup. For me, it’s gotta be more. And this is the Navy Bean Soup that delivers. Navy Bean Soup with Bacon. And just in case you think I’m becoming “trendy” just because I’m adding the word “bacon” to my Navy Bean Soup with Bacon, this has been a family fave for over 40 years. So long ago that I don’t even remember where I came by the recipe. I wish I did because I think in the same book was a bread recipe I loved and no longer have. So if you happen to “know” this soup and know the pedigree, let me know, please! My Navy Bean Soup isn’t so far off the beaten track that you won’t recognize it as Navy Bean Soup but it does have a few secret ingredients that so perfectly enhance the flavor. Even those who are lukewarm about Navy Bean Soup seem to love my Navy Bean Soup with Bacon, and those who like the Senate Navy Bean Soup go nuts over this more highly flavored bean soup. I’m tellin’ ya – once you try it you’ll never go back! This really is the bean soup to rule all bean soups. Flavor for days. There are a ton of carrots, onion, and celery that all but blend into the soup. The broth is silky and takes some of its body from a little potato, cooked and mashed and then stirred in. There’s just a touch of tamari or soy, not enough to taste, but just enough to give the soup a back note of rich umami flavor. Add to that a sprinkle of thyme to enrichen the flavor of the soup and a bit of oregano tossed in towards the end of the cooking that makes you sit up and take just a bit of notice. But best of all, of course, there’s the wonderful ham broth and bacon~ both in one soup. You can’t beat that for double porky palooza perfection. Overall, though, in spite of how good this Navy Bean Soup with Bacon is, it’s still pretty good for you. I wonder if all the cholesterol-fighting properties of the Navy Bean cancel out the bacon? Let’s see what the World’s Healthiest Foods happens to say about the Navy Bean. I haven’t made this Navy Bean Soup for a while or else I’d def update the photos as I’m updating the text in 2018! It’s on my list, believe me. But isn’t there something about one crappy photo on a blog post from almost 10 years ago that just testifies to good home cooking? Maybe not, but I’d like to think so, lol! The original recipe calls for adding the ham bone to the soup and cooking along with the Navy Beans as they cook to tender perfection. I really don’t think that’s enough time to really break down and soften all the meat on the ham bone, let alone coax out all the marrow and collagen for the best tasting broth. The recipe writers must have come to that same conclusion because they call for using chicken broth to supplement the flavor. Like it’s after Holiday Ham counterpart, Split Pea Soup, Navy Bean Soup with Bacon is downright cheap to make. 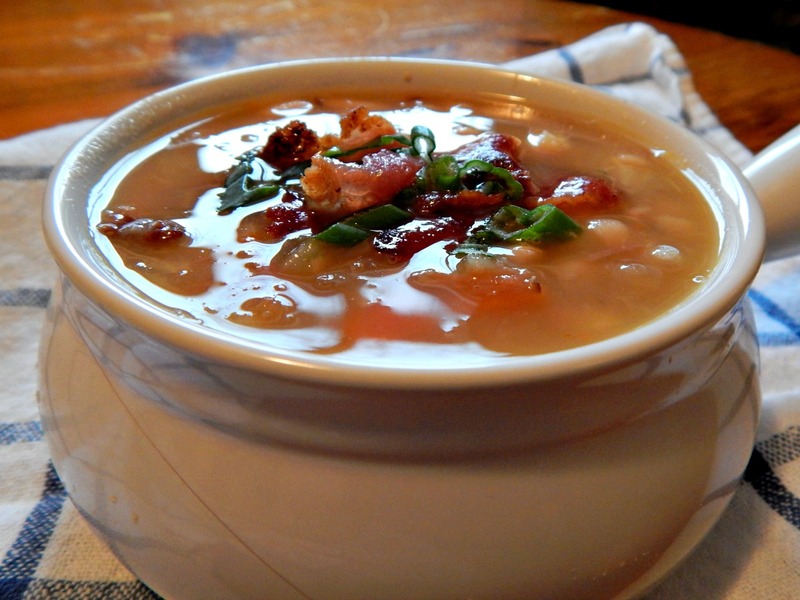 This recipe was made and priced in 2012 at $2.00 and repriced in February 2014 as $2.95.Think about doubling it; Navy Bean Soup with Bacon freezes well, it’s a great soup to divide into portions for lunches or freeze for a meal. It separates when thawed so just stir it back together. Make sure to buy your beans from a store with a high turnover. I like to not only soak my beans, but brine them, also, and I think the best beans are soaked overnight rather than quick soaked – either will work, though. See my post on Soaking and Brining Beans for more information. chopped parsley, chives or sliced green onion for garnish, as desired. Drain beans, rinse if desired. Place in a large pot and add 12 cups of stock, bay leaf, tamari, and thyme, along with the ham bone. Bring to a boil and simmer 30 – 40 minutes, till beans are just tender. Meanwhile, in another pan, cook potatoes in boiling water until tender. Drain and mash potatoes with 1/2 cup milk and set aside. Fry bacon, remove and set aside and reserve (see note) then saute vegetables, garlic, and parsley in three tablespoons of drippings. If there are not enough drippings, add a bit of oil or butter. After the vegetables have softened, add them to beans along with the oregano, and simmer, one hour or so. Mash the beans and return to the pot along with the mashed potato mixture. Shred the chunks of ham and any ham remaining on the bone. Discard bone and return meat to the pot. Simmer gently about 10 more minutes to thicken the soup. Taste for seasoning and add salt or pepper as desired. Crumble the reserved bacon and sprinkle over the individual servings. Garnish with parsley, chives or sliced green onion, as desired. The bacon may be mixed in with the soup instead of being used as a garnish, although I prefer it crisp on the top; it will lose it’s crispness if mixed in with the soup as a whole. Rather than using the ham bone for this soup, I prefer to make my Best Ham Stock and use part of it for this soup. While the recipe is great as written, I like to get a lot more out of my ham bone by simmering it much longer and using the richer broth for two soups. Nutrition: Per Serving (about 2 cups): 196 Calories; 2g Fat (11.9% calories from fat); 11g Protein; 30g Carbohydrate; 10g Dietary Fiber; 3mg Cholesterol; 230mg Sodium. Exchanges: 1 1/2 Grain(Starch); 1/2 Lean Meat; 1/2 Vegetable; 0 Non-Fat Milk; 1/2 Fat. This entry was posted in Click here for Bargain Meals, Click here for Fabulous Food Posts and tagged Bacon, Bargain Meal of the Week, Beans, Dried Beans, Freezes Well, Ham, Heritage Recipe, leftover ham, Leftovers, Navy Bean Soup with Bacon, planned leftovers, Soup. Bookmark the permalink.